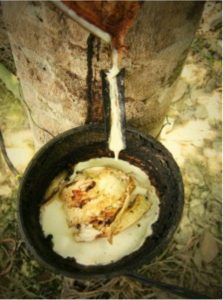 Natural Rubber was discovered around 1600BC in Latin America, and is produced from the Sap of the Hevea Brasiliensis Tree, also known as the Para Rubber Tree. These trees are now primarily grown and harvested in three regions; Africa, South America and Asia. In its raw form, Natural Rubber is extremely resilient, however due to its ‘natural’ nature provides poor homogeneous properties, low tensile strength and wear resistance. It also becomes stick under high temperatures. It wasn’t until over 3000 years later that Natural Rubber was developed into a material that could be utilised into Industry and be used as a manufacturing material, such as Automobile Tires and Castor Wheels and other General Rubber Goods. 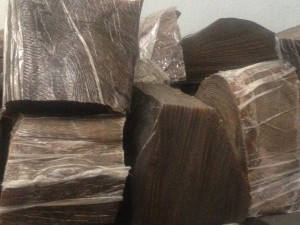 As discussed above, Raw Natural Rubber is mixed with other “Fillers” and “Additives” to provide a Rubber Compound with the required mechanical properties for a Castor Wheel. Carbon Black is produced by the partial combustion of heavy petroleum products, such as Coal Tar. It is similar to appearance to Soot, being a fine black powder. Carbon Black improves the characteristics of the Castor Wheel, such as material stability, weather-resistance, and wear resistance of numerous products. 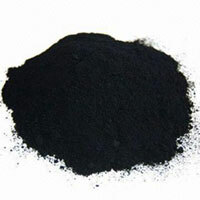 Carbon Black also acts as a pigment, giving the compound its Black colour. The Castor Wheel industry utilises carbon black as a reinforcing filler to improve tensile strength and abrasion resistance of the castor wheels rubber tread. Typically vulcanised, non carbon black rubber has a tensile strength of around 2.5MPA and almost zero resistance to wear. With the addition of Carbon Black the tensile strength can be increase to around 20-23MPA, and wear resistance significantly improved. Carbon Black is commercial available in different grades, which are specified by their particle size. The particle size typical ranges from 20nm to 350nm. The smaller the particle size, the better the tensile strength typically is, however this comes at a cost, with the finer grades costing considerably more. As discussed in previous blogs, most rubber compounds look identical, regardless of the Base Polymer, Additives, Fillers and Carbon Black particle size. This can create difficulties in comparing a products quality. At Bulldog Castors Ltd we employ polymer specialists who understand the importance of compound formula’s and manufacturing methods. Having in house testing to check mechanical properties of different rubbers, we provide market leading testing and experience to give our customers the assurances that products are manufactured to provide satisfactory performance and longevity.